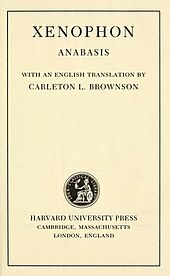 Xenophon's Anabasis, translated by Carleton Lewis Brownson. 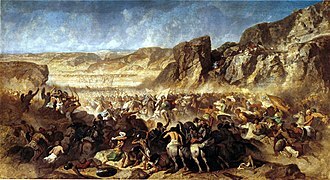 The Persian Expedition, trans. by Rex Warner (1950), introduction by George Cawkwell (1972), Penguin Classics 2004 (ISBN 9780140440072). ^ Liddell, Henry George; Scott, Robert. A Greek-English Lexicon on Perseus. ^ Durant, Will (1939). The Story of Civilization Volume 2: The Life of Greece. Simon & Schuster. pp. 460–61. ^ Hellen, iii, i, 2 cited in William Mitford; Baron John Mitford Redesdale (1838). The History of Greece. T. Cadell. p. 297. ^ Xenophon (1854). The Anabasis, Or Expedition of Cyrus: And the Memorabilia of Socrates. H. G. Bohn. p. 5. ^ The cry, written in Greek as θαλασσα, θαλασσα, is conventionally rendered "Thalassa, thalassa!" in English. Thalatta was the Attic pronunciation, which had -tt- where the written language, as well as spoken Ionic, Doric and Modern Greek, has -ss-. ^ Jason of Pherae's plans of a "panhellenic conquest of Persia" (following the Anabasis), which both Xenophon, in his Hellenica but also Isocrates, in his speech addressed directly to Phillip, recount, probably had an influence on the Macedonian king. ^ cf. Albrecht, Michael v.: Geschichte der römischen Literatur Band 1 (History of Roman Literature, Volume 1). Munich 1994, 2nd ed., pp. 332–334. ^ Brennan, Shane (2005). In the Tracks of the Ten Thousand: A Journey on Foot through Turkey, Syria and Iraq. London: Robert Hale. ^ Davies, Paul (1996). Grace: A Story. Toronto: ECW Press. Bassett, S. R. “Innocent Victims or Perjurers Betrayed? The Arrest of the Generals in Xenophon's ‘Anabasis.’” The Classical Quarterly, vol. 52, no. 2, 2002, pp. 447–461. Bradley, P. Xenophon’s Anabasis: Reading the End with Zeus the Merciful. Arethusa 44(3), 279-310. The Johns Hopkins University Press, 2011. Brennan, S. “Chronological Pointers in Xenophon's ‘Anabasis.’" Bulletin of the Institute of Classical Studies, vol. 51, 2008, pp. 51–61. Burckhardt, L. Militärgeschichte der Antike. Beck'schen Reihe; 2447. München: Verlag C. H. Beck, 2008. Buzzetti, E. Xenophon The Socratic Prince: The Argument of the Anabasis of Cyrus. Recovering Political Philosophy . New York: Palgrave Macmillan, 2014 . Flower, M. A. Xenophon's Anabasis, or the Expedition of Cyrus. Oxford Approaches to Classical Literature. Oxford; New York: Oxford University Press, 2012. Lane Fox, R., ed. The Long March: Xenophon and the Ten Thousand. New Haven; London: Yale University Press, 2004. Lee, J. W. I. 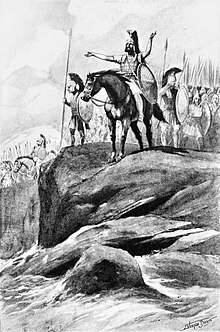 A Greek Army on the March: Soldiers and Survival in Xenophon's Anabasis. Cambridge; New York: Cambridge University Press, 2007. Nussbaum, G. B. The Ten Thousand. : A Study In Social Organization and Action In Xenophon's Anabasis. Leiden: E. J. Brill, 1967. Rood, T. Space and Landscape in Xenophon's Anabasis. In Kate Gilhuly & Nancy Worman (Eds. ), (pp. 63–93). Space, Place, and Landscape in Ancient Greek Literature and Culture. Cambridge; New York: Cambridge University Press, 2014.